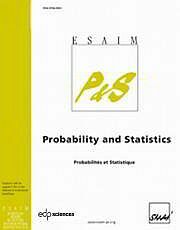 The journal publishes original research and survey papers in the area of Probability and Statistics. It covers theoretical and practical aspects, in any field of these domains. Of particular interest are methodological developments with application in other scientific areas, for example Biology and Genetics, Information Theory, Finance, Bioinformatics, Random structures and Random graphs, Econometrics, Physics. The intention is to develop the journal in the direction of applications and to open it to various fields where random mathematical modelling is important.